Fantastic. 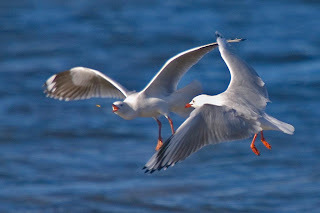 I like gulls and now I like them even more.I spend a lot of time fishing and when they're not biting I try to photograph the gulls.What sort of camera and lens do you use? A few years ago I was watching a grey shrike thrush here and I thought it was just having a drink from one of my frog ponds and I nearly ignored it. When I crept up to have a closer look. It was actually spearing tadpoles. I have always had a second look since then. I use a Canon DSLR coupled with a relatively light Canon 100-400mm lens. I consider this set up a good choice if you're birding and want to take the odd bird photograph--as opposed to carrying more dedicated (and heavy) prime lenses. I spend a deal of time on the local beach photographing cormorants, terns and of course, gulls. This is a great way to hone one's skills at taking inflight shots and occasionally record odd goings on! I photographed a shrike-thrush at a small pool which seemed surprisingly tame--it kept returning despite my presence. Then I realised that it was getting an easy meal of wasps that were drinking around the perimeter.